Tasked with communicating 3D form through a 2D poster, Maddy Cha and I created this poster. 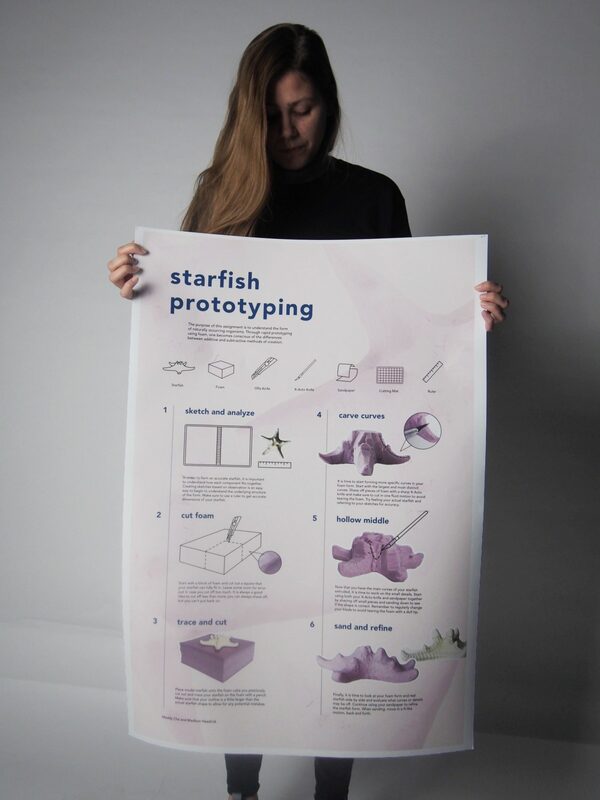 Choosing to focus on creating a poster informing an audience on how to use foam for 3D modeling, we used a starfish as the subject of our poster. We started by first mapping out each step of 3D modeling from each of our own experiences. While it was important to be as specific as possible, we also had to keep our audience in mind – someone who may not be as familiar with design and 3D modeling. 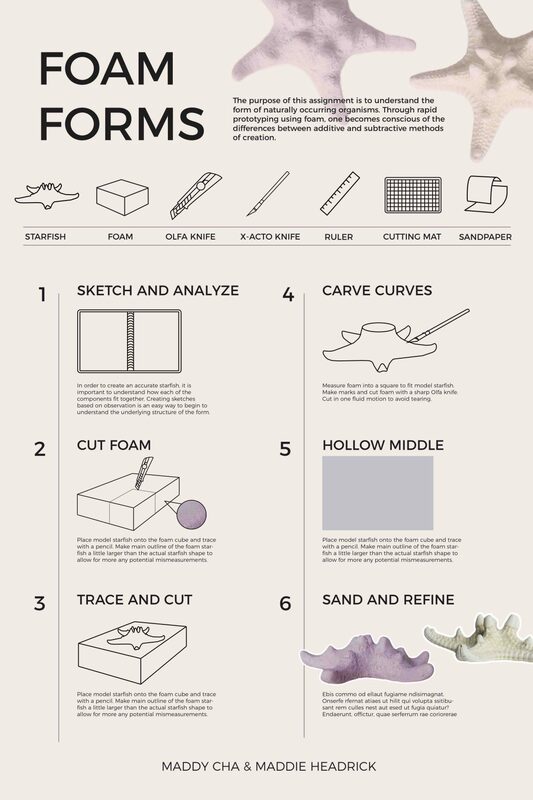 We formulated each step of the process so that even a person that has never worked with foam could fully understand the instructions. 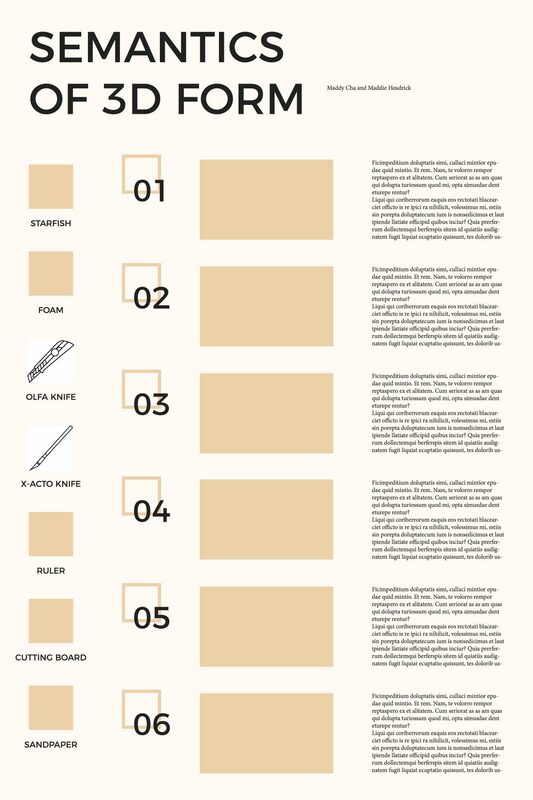 Once we had nailed down the content for our 24×36 poster, we began to form a color theory for our work. 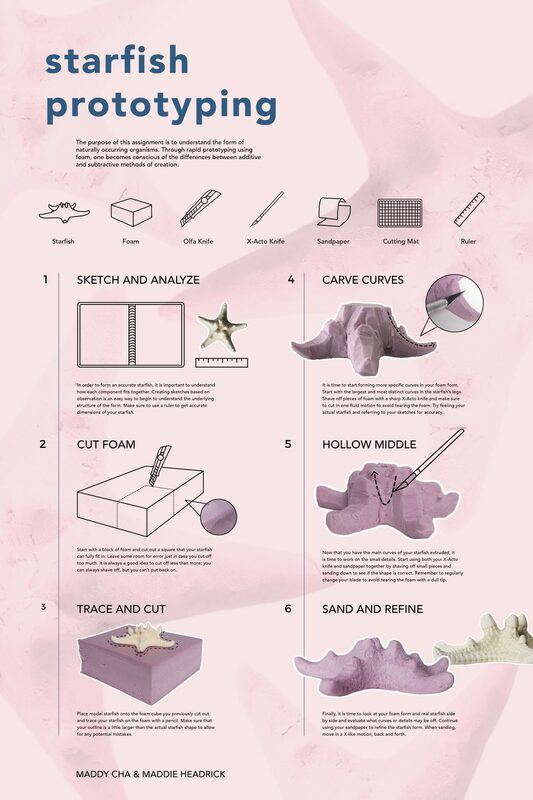 Using the pink foam as an inspiration, we decided to use light tones of pink and accents of blue to exhibit our work. It was important to us that the color and typeface used were inviting and eye catching both from afar and close up. The layout of our poster was our next step. Important aspects that we had to consider was how much space was needed for each step and whether that space would be dynamic or the same for each step. We began by making simple wireframes, then chose a design we felt was appropriate, adding complexity with color and imagery. We began by only using icon visuals to represent each step, but after feedback from classmates and professors, we added photos to ensure that the user gets a full understanding of material and process. Through this project, I began to grasp what it meant to design for a specific user. 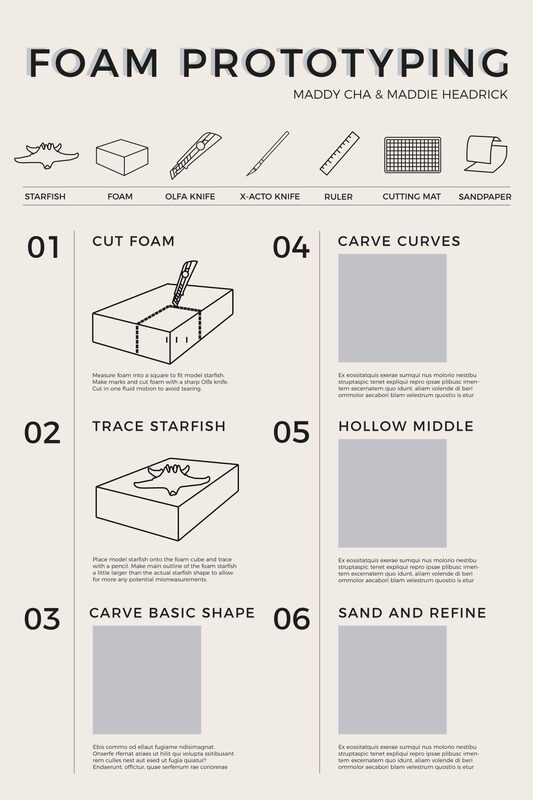 Rather than making and designing for myself or my professor, I have become more mindful of users and how they play a huge part in the design process. 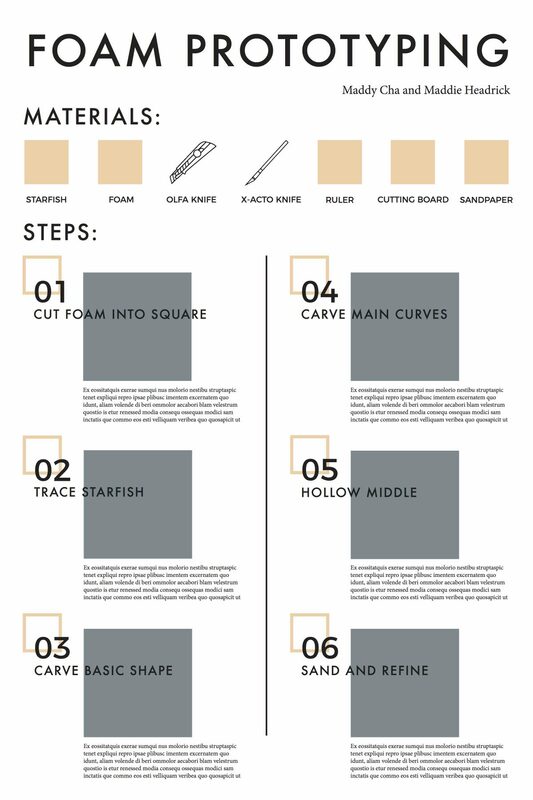 This project also trained my eye to the use of style and type treatment, in that sometimes having too much color, text variation, and imagery, can actually hinder communication. Taking a step back and checking our consistency was one of the most important steps we took as we refined the details of the poster. This being a team project, I also learned valuable lessons on teamwork and the importance of coming into each team project understanding that your teammates always have something to offer. I enjoyed learning from my partner and collaborating in a way that both of our skills were exhibited. beginning iterations on different layouts of the page and where blocks of text could be placed. Refining text placement and visuals was important during this stage of the project. At this point, we shifted our focus to be more detailed in our visuals.